If there’s one thing I’ve learned about myself over the years, it’s that I’m a huge wuss. I feel like Gina in Empire Records right now, but I’ve been a big fan of ultimate frisbee for years. I’m not great at it, but compared to baseball or basketball, I’m an Olympian at Ultimate. The problem is that, even since all my buddies either left or got laid off from Wizard then we got moved down to the city, I haven’t been able to get a good game of Ultimate together with my friends. I recently started looking around here for a pick-up game and the best I found was one about 45 minutes away. But I don’t know anyone there and, like I said, I’m a big wuss, so I don’t want to drive up there and just join in, especially because I haven’t played in a year or two. So, until I grow an adult set of balls, I’m either going to organize my own game (that doesn’t bother me for some reason) or get more into playing disc golf. Yesterday, I got a bug in my ear and decided to actually look into the whole disc golf thing. Back home in Toledo there was a pretty nice course close to my house. I played a few time with a couple of my buddies. I wasn’t very good, but it was fun. I told the missus about the whole thing and she got interested. 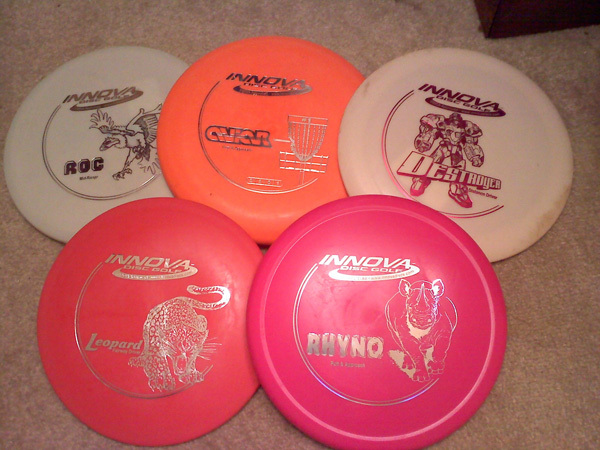 Turns out there’s a pretty nice course called (for some reason) Brakewell Steel/Warwick not too far away and we were able to get some pretty reasonably priced discs at the PlayItAgain Sports that’s less than a mile away (you can see them above). We each got a putter and a long range disc and I got a mid range. The top row are mine (of course, I got the Destroyer because of the Transformer-like robot on it) and the bottom are hers (pink, of course). For those of you who might not know, disc golf involves throwing discs from a tee off point (usually a cement slab) towards a hole which is actually a metal basket with chains hanging down (I assume to slow down and “catch” incoming discs). Like with regular golf you want to get into the hole with as few throws as possible. Pretty simple and pretty fun. The course–which is free to the general public–has 18 holes and then a secret 18 holes in the back called Wolfe Woods that we accidentally stumbled upon because we didn’t print the above map out ahead of time and couldn’t find the freakin’ 16 hole. The main course totally kills the course in Toledo. There’s two different tee off spots for most holes and two different baskets for every hole, so you don’t have to be super great. The missus and I generally got to the hole in just a few throws over par. I’ve got to figure out how to stop hitting trees and having my straight throws arc to the left. It was a lot of fun getting outside (being a writer, I spend most of my time sitting either on my couch or a coffee shop), walking around in the sun, hanging out with the missus and throwing some discs. Today, my shoulder’s a little sore–like I said it’s been a long time since I’ve thrown any kind of disc–and my TV, AC and dish washer are all on the fritz, but I’m hoping to get back out on the course this week when things calm down a little. Next time I’ll try and take some pics of the course.